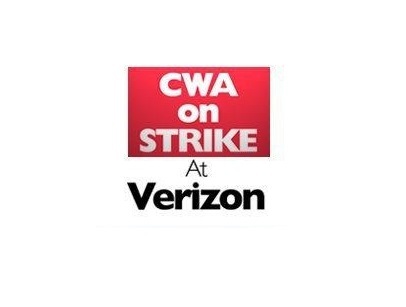 CWA and IBEW Set to Go On Strike at Verizon Wednesday, April 13, 6 a.m.
After ten months of intensive negotiations to reach a fair contract with Verizon, the CWA and IBEW have announced a strike deadline of 6 a.m. on Wednesday, April 13. We will set up picket lines and shut this company down if a fair agreement is not reached by then. Verizon made $39 billion in profits over the last three years — and $1.8 billion a month in profits over the first three months of 2016 — but the company is still insisting on givebacks that would devastate our jobs. The company wants to gut job security protections, contract out more of our work, freeze our pensions at 30 years of service, shutter call centers and offshore the jobs to Mexico and the Philippines. If we don’t accept all of these changes, they will require technicians to work away from home for as long as two months at a time, anywhere in the Verizon footprint, without seeing their families. Verizon has also totally refused to negotiate any improvements in wages, benefits or working conditions for Verizon Wireless retail workers who formed a union in 2014. The company’s greed is disgusting. Lowell McAdam made $18 million last year—more than 200 times the compensation of the average Verizon employee. Verizon’s top five executives made $233 million over the last five years. Last year alone, Verizon paid out $13.5 billion in dividends and stock buybacks to shareholders. But they claim they can’t afford a fair contract. And it’s not just workers who are getting screwed. Verizon has $35 billion to invest in the failing internet company, Yahoo, but refuses to maintain its copper network, let alone build FiOS in underserved communities across the region. And even where it’s legally committed to building FiOS out for every customer, Verizon refuses to hire enough workers to get the job done right or on time. It’s time for Verizon to acknowledge that working families also have a right to do well in America. It’s time for a contract that’s fair to Verizon’s working people and the customers we serve. Going on strike is a decision that is not made lightly. Your bargaining team has worked countless hours to negotiate in good faith to reach an agreement. We have indicated a willingness to help the company cut its health care costs by hundreds of millions of dollars. But our good faith has not been reciprocated. It has been met by an arrogant disrespect for both workers and consumers. That is why we have made the decision to hit the streets two days from now. We are counting on every member to dig in, be prepared, join picket lines, picket Verizon Wireless Stores, and demonstrate the commitment and solidarity that have been the values we’ve lived by throughout CWA’s proud history. If the company changes course and shows a willingness to bargain in good faith, your bargaining team stands ready. In the meantime, we will do whatever we have to do to win a fair contract for 39,000 Verizon workers from Massachusetts to Virginia. Solidarity forever!